A huge bust that took place this month surprised even the most experienced cops in the Toronto area by its sheer size and could possibly qualify as the largest in city history. Acting inspector of the Toronto police Steve Watts spent more than two decades working in drug enforcement and he claims he never saw a drug operation of this size during his career. That’s less of a shocker when you take a closer look at all the narcotics that have been found during the investigation codenamed ‘Project Polar’, that took six weeks to unfold to its spectacular conclusion. The action netted a mind-blowing 73 kilograms of cocaine, with another 21 kilograms of crystal meth and 8 kilograms of ecstasy found in the possession of the same suspect. Total value of confiscated drugs is estimated at $9 million. It is apparent that the shipment of drugs was sufficient to supply the greater Toronto area for quite some time and maybe even provide steady influx of drugs to a few other places in Canada or U.S.
32 year old Nicholas Shouldice was the person arrested in relation with the drug seizure, but no accomplices have been identified initially – and it’s obvious that a single person couldn’t possibly handle such an enormous load alone. Mr. Shouldice was safeguarding the drugs in his pickup truck and his home, but the police believe he was acting on behalf of a large criminal organization. While he doesn’t have a prior criminal record, the suspect will have a hard time explaining to the judge how he came in possession of industrial quantities of multiple drugs. He will certainly face trafficking charges and could go behind bars for a long time if found guilty by the courts. 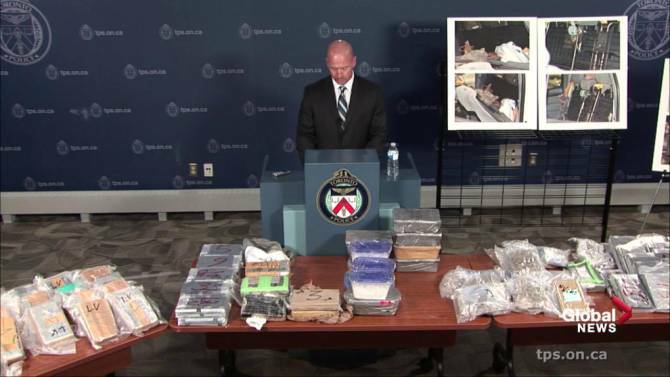 According to inspector Watts, 73 kilograms of cocaine are the most ever discovered in metropolitan Toronto, apart from border intercepts of incoming drugs taken by the Canada Border Service Agency. Cocaine use is clearly on the rise in Canada, since around 678 kilograms of white powder have been confiscated in Toronto since the start of 2016. A shipment of 20 kilograms was discovered on the Pearson International Airport in July this year, demonstrating that this city has become a premium destination for international trafficking. The latest bust might disrupt the local drug market for a while, but it’s unlikely to reverse the trends for as long as demand for stimulant drugs remains strong.